Heat or Eat? Help neighbors facing tough choices this winter. No one should have to choose between utility bills and food. As you turn up your heat this winter, please remember your neighbors who need your help to get through the cold winter with a warm home and a hearty meal. 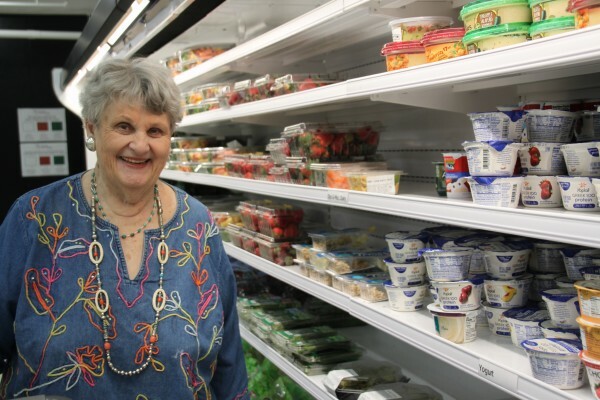 A gift from you today will provide much-needed meals and groceries for our neighbors in need like Lois (pictured here at Crystal Lake Food Pantry). With a small fixed income and varying utility bills, people like Lois struggle every day but that wasn’t always the case. Lois and her husband raised six children. They worked hard and were self-sufficient until recently when Lois’ husband had a stroke that left him unable to work. Lois is retired, and they live a modest lifestyle with limited monthly expenses. They often can’t fit a trip to the grocery store into their budget. Lois is surprised to find herself in a position of need - "I never thought I'd be here," Lois says. What you do matters now for those facing tough choices this winter! Every $1 you give helps provide $8 worth of groceries. Thank you for your generosity. Yes, I'd like to automatically repeat this gift each month.